Humans are inherently collectors. House sizes in America are huge today compared to what our grandparents owned, and we are stuffing them to the brink of explosion with "stuff." I try to live a lean "smart stuff life" but with a couple three terabytes of hard drives and RAID arrays around, I have found that I collect data. Lots of huge files like music (albums not just tracks) remixes that can be hours long and increasingly movies ripped and compressed with Divx from my DVD collection. Managing this was a pain, and consuming was even harder as I had several appliances to help do so. My original Xbox running XBMC was good, but that hardware was getting rusty with no HDTV capabilities. The AudioTron from Turtle Beach did music really well but maxed out when I hit 32k songs 5-years ago. My Roku HD-1000 did MPEG2 movies and photos but the UI was cumbersome, if not abysmal. My different trials of firmware for the Xbox360 along with a NAS networked PC running Transcode 360 did other file types OK, but that's two full PC's to feed one living room media habit! Worst of all, this meant that I needed three different devices, with different UI's and input sources on the TV and amplifier. The geek acceptance factor (let alone what I speak of as the WAF - or wife acceptance factor) were reaching all-time lows. What is my solution for the "all format/both local and online media player" today? It's boxee.tv - I've been working with the amazing team of developers (all who have funny accents from Israel) since the beginning of 2008 and am proud of their technical prowess and achievements in what I think is the ultimate 10-foot user interface for the television. This is software that begs to be put on the big-screen, with just a cheap DVI or HDMI cable be from your computer to control the media that you, like most others, are collecting. The software needs to be seen to believed, and if you have a Mac, or Linux computer, you can get in on our Alpha test. I gotta say, the software feels more like Beta to me, as I've been watching less of my two TiVo HD boxes (both Sat and cable fed) and more of online over the top video and local content on my Mac Mini connected to the same TV as the TiVos. 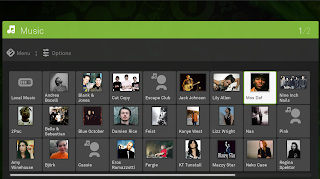 If you are more of a music and photo collector with few movie rips, which is understandable, still give boxee a try - the team has put thousands of videos available for streaming or legal downloading within the rich user interface. You can ease your way into video collecting without fear of piracy. I crack up at the videos that are available and never would have found them without the comfort of browsing available online media from my couch!